These are the front and the back panels of Lemote Box. Upper is the front panel, from left to right: 4 USB 2.0 ports, mic, phone, line out, infrared port, IDE indicator light, power indicator light, reset button, power switch. Lower is the back panel, from left to right: PS/2 port, networking port, VGA output, S-Video output, COM, power supply(DC 12V). 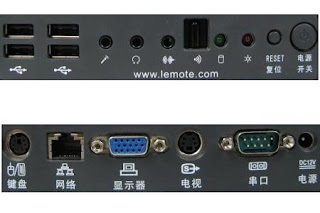 The S-Video output makes it possible that TV set with NTSC mode be the monitor of Lemote Box. Currently, it supports only 800x600 resolution on TV set. But it is a good start. NTFS should be NTSC, are you thinking about the format of the partition when you writing? It will be better to say "mic" instead of "audio input" and "audio output" should be "line out". "Audio input" and "output" are also OK! Thanks for your effort on promoting Loongson CPU! I was stupid to make such a mistake. It should be NTSC, not NTFS. My mind was flying too far. I used to think over whether "mic" is better than "audio input". But actually mic port can be also utilized by other audio input devices such as tape recorders. For "line out", does it still mean audio output not given a particular context? I've no idea.I should ask native speakers for help.